mmsonline.com March 2017 MMS 107 BETTER PRODUCTION Shops Using Technology design, surface finish and geometry to make the optimum tool for the customer's application. Taurus set up what it calls its "simulation sta- tion" on the shop floor, providing four seats of ANCA Cimulator3D software that operators can use at any time. Two other ANCA Cimulator3D seats are in the front office. Cimulator3D simulates the programmed tool path just as it would be ground on the machine. New tool programs can be verified for size, shape, machine clearance and even cycle-time estimates. Cimulator3D maintains continuous work f low through the machine by reducing development time and trial grinding. 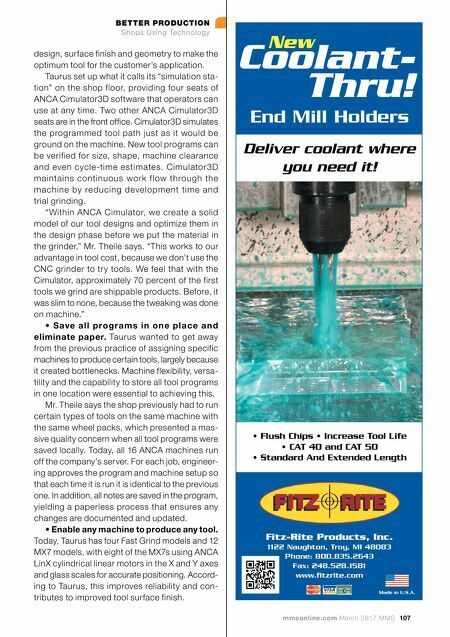 "Within ANCA Cimulator, we create a solid model of our tool designs and optimize them in the design phase before we put the material in the grinder," Mr. Theile says. 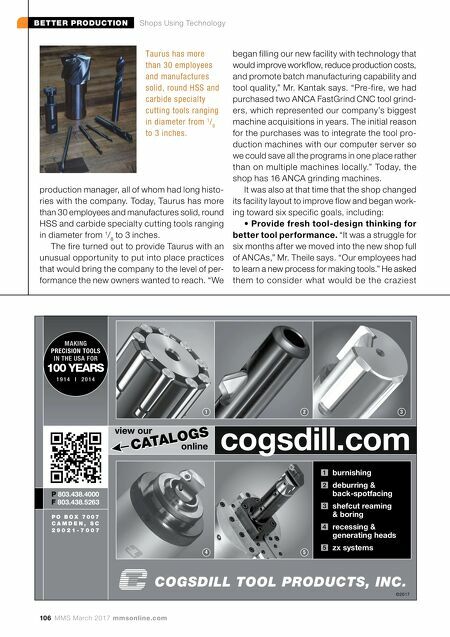 "This works to our advantage in tool cost, because we don't use the CNC grinder to tr y tools. We feel that with the Cimulator, approximately 70 percent of the first tools we grind are shippable products. Before, it was slim to none, because the tweaking was done on machine." • S ave a l l p r og r a m s i n o n e p l ac e a n d eliminate paper. Taurus wanted to get away from the previous practice of assigning specific machines to produce certain tools, largely because it created bottlenecks. Machine flexibility, versa- tility and the capability to store all tool programs in one location were essential to achieving this. Mr. Theile says the shop previously had to run certain types of tools on the same machine with the same wheel packs, which presented a mas- sive quality concern when all tool programs were saved locally. Today, all 16 ANCA machines run off the company's server. For each job, engineer- ing approves the program and machine setup so that each time it is run it is identical to the previous one. In addition, all notes are saved in the program, yielding a paperless process that ensures any changes are documented and updated. • Enable any machine to produce any tool. Today, Taurus has four Fast Grind models and 12 MX7 models, with eight of the MX7s using ANCA LinX cylindrical linear motors in the X and Y axes and glass scales for accurate positioning. Accord- ing to Taurus, this improves reliability and con- tributes to improved tool surface finish. Coolant- Thru! End Mill Holders New Deliver coolant where you need it! Fitz-Rite Products, Inc. 1122 Naughton, Troy, MI 48083 Phone: 800.835.2643 Fax: 248.528.1581 www • Flush Chips • Increase Tool Life • CAT 40 and CAT 50 • Standard And Extended Length Made in U.S.A.